Installing Windows 7 with a Flash USB drive is by far the easiest and fastest way of installing Windows OS. But in the same time, a common issue “A required CD/DVD drive device driver is missing” would occur during the installation, which makes you feel more confused because you even don’t have a disk drive. Though the error message is saying the problem was caused by missing drivers, you have to know this might be not driver problem. Read on to find the answer and solutions to fix this problem. 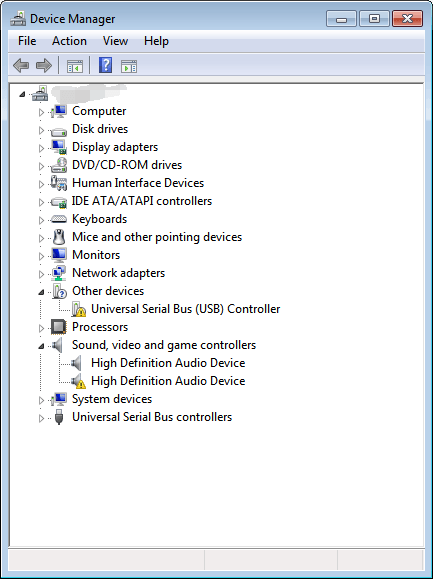 The problem caused because the USB drive is not recognized by Windows PE (Windows Preinstallation Environment ). Windows PE is built on Windows 7 kernel and is used to prepare a computer for Windows installation. So if the USB drive is not recognized by Windows PE, you may encounter this problem and cannot install the system. Try solutions below to fix the problem. Just unplug the USB drive and plug it back in the computer, then the problem should resolve. You may not believe it, but it is the easiest and most useful solution to fix problem. If unplugging doesn’t work for you, try another switch port. If you are using USB 3.0 port, switch it to USB 2.0 port and try installing the system again. Faulty USB settings in BIOS may also cause the problem. Windows 7 install media doesn’t have native support for USB3.0. So if your BIOS has any settings for USB3.0 support during start up, turn it to AUTO or DISABLE. If you are having difficulty with updating driver manually, you can use Driver Easy to help you. Driver Easy is a driver update tool which will help you download and update all drivers automatically. You can use it to scan your computer to detect problem drivers then download new drivers. Driver Easy provides Free version and Professional version. To get higher download speed and save more time, you can consider using the Professional version. With Professional version, all drivers can be downloaded and installed with just 1 click. What’s more, you can enjoy free expert support guarantee and 30-day money back guarantee. You can contact us for further assistance regarding the installation failure issue.